Astral travels, Out Of Body Experiences, and Mental projection are names given to out of body spirit experiences. The idea is to project the mind and or spirit out of the body and into another region. The Astral Travel incense blend was created to aid in just this sort of work. 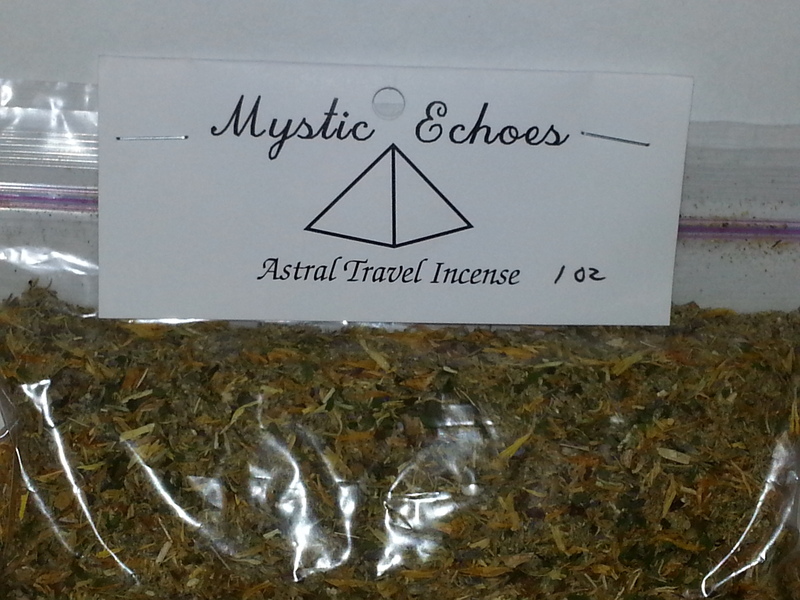 Mystic Echoes created this blend to be a specific aid in astral travels as the scents combined here powerfully propel the user into the astral realms. This incense blend is a combination of Mugwort, Marigold, Ginkgo Leaf, peppermint, and Lavender. All of these herbs have different levels of association with psychic abilities and psychic development. Many of these herbs can be used individually to assist in Astral travel, yet they work most effectively when they are combined together as a united product that they are at their most powerful. Marigold is an herb that has a long history for healing. It is not just associated with healing though. Marigold actually is a very potent psychic herb. This herbs psychic associations are in prophetic dreams and astral travel. Both of these are key skills in working with developing the powers of the mind. It is the astral projection assistance that is why the herb was chosen for this incense blend. Mugwort is the base herb for this tincture. This herb has been used by many witches for many years as an aid in developing psychic abilities. The herb is strongly associated with psychic work and trance activities. This herb is known to aid in astral projection and psychic sight. It is for the psychic abilities aspect of this herb that it was chosen to be the base for this tincture. Peppermint have associations with mental focus and clarity as well as mental powers. The ability to focus and concentrate is key to being able to develop skills in meditation, astral travel, and even prophetic or lucid dreams. Peppermint works more with mental powers. This aids in concentration and focus with mental powers being concentration and focus. Lavender is a herb that has any different purposes. This beautiful flower is a popular herb because of its scent and its versatility. Use wise Lavender can be used in incenses and in tinctures’. One of the most common uses is a satchel under the pillow to aid in peaceful sleep and healing. Astral travels are in a sleep like state. The sleep aspect of Lavender is why it was chosen as an aid in astral travel. Ginkgo Leaf was added to aid in mental focus and concentration. Often times when a person begins to learn to get into trance and meditative states the mind can wander from the task at hand. Ginkgo leaf is in this incense to aid in focus and concentration This herb also allows for mental clarity which means the messages from spirits and beings will come through clearer. Burn this incense during meditation or trance rituals to have extra assistance in reaching the spiritual realms and engaging with spirits.